This estate has ever since remained in the possession of descendants of the "Anabaptist", and is now [Editor's note: 1897.] owned and occupied by members of the family. The given name of the "Anabaptist" unfortunately does not appear in the records, nor is there any further account of his ancestry. Tradition says the Blickensderfers originally came from Switzerland, being disciples of Menuo Simons [Editor's note: Menno Simons], and were expelled from that country on account of their religious tenets. There is an old place in Switzerland, near the city of Zug, called Blickensdorf, but it is now only a small hamlet. However, the fact of the existence of this old dorf of this name and the fact that many Blickensderfers still reside in this vicinity lends credence to the tradition. 2. I - Christian, born March 6, 1724, died April 8, 1800. 3. II - John, born, date not known; died, date not known. 4. III - ____, born, date not known; died, date not known. 5. IV - Jacob, born, date not known; died, date not known. 6. V - Ulrich, born, date not known; died, date not known. 7. VI - Jost, born February 2, 1735; died, July 13, 1826. The order of the birth of these sons is not known further than that Jost is known to have been the youngest and Christian was probably the oldest. Besides the Anabaptist and his descendants, there is a family of Blickensdoerfers residing in the vicinity of Schmitterhof, Germany, of whom one named John, born October 22, 1815, was yet living in 1893, and also a nephew of his; but all they knew or could tell of their ancestors was that John's father was named Jacob, and his grandfather, John; but when either was born they knew not. Nor did they know whence their family came nor when it first appeared about Schmitterhof. In attempting to trace this family back, we cannot place the birth of the father, Jacob, earlier than about 1780-1790, nor that of the grandfather, John, prior to about 1750-1760. This would make this oldest ancestor, John, contemporary with the Anabaptist's grandson, born in 1754. But George was an only child and his descendants are all known and it is generally conceded that the Anabaptist had but six sons, one of whom was the father of George, and the other five emigrated to America, and with their descendants remained there. From this it would follow that if the Blickensdoerfers at Schmitterhof have the same origin with those at the Kohlhof and in America, the connecting link between them must lie at least as far back as the Anabaptist or his ancestors; that is, prior to 1700. They may be descendants of a brother, or some other relative of the Anabaptist, but are not his descendants. If the tradition that the Blickensdoerfers were expelled from Switzerland be true, it is not improbable those at Schmitterhof are descendants of a different branch of the same family, from whom the one who purchased the Kohlhof in 1716 is descended, and may have settled at Schmitterhof about the same time as the latter settled at the Kohlhof. John, born October 22, 1815, had two brothers, Michael and Peter, both younger than himself. Michael married Cath. Geiger. They had three sons, Peter, Paul and William, all living in 1893. Peter married Philippena Lohring. They have one son, John and two daughters, Barbara and Marie. John has no children. There are also other Blickensdoerfers in Europe, but there is no known connection between them and those at Kohlhof or Schmitterhof, although it is not improbable that all are descendants from a common ancestor in Switzerland. Christian was born March 6, 1724, at the Kohlhof, in the Palatinate. Married, January 7, 1748, Catharine Shurger, the daughter of a Mennonite preacher, at Eisenbach, Zweibruecken, where she was born October 14, 1727. After his marriage he moved to Neider Saulheim, where he resided several years. In 1753, he, with his family, emigrated to America, accompanied by his youngest brother, Yost, then a lad of eighteen years of age, landing at Philadelphia September 29 of that year, from the ship Rowand, Arthur Trau master, from Rotterdam, via Cowes. Both Christian and Yost signed the declaration of allegiance to the king of England, at the time required of all immigrants into Pennsylvania, and which is preserved in the Colonial records at Harrisburgh. After remaining about a year and a half in the vicinity of Philadelphia, Christian removed to Lancaster county and settled on a farm near Lititz, where he resided until the spring of 1761, when he built a house in Lititz and became a resident of that town, remaining there until his death. He was a farmer, with but little patrimony, most of which was expended in reaching America, but earned his support largely by teaming, an occupation very common in early times, before the construction of canals and railways; and from the exposure incident to which, he in later years became an invalid. But being of industrious and frugal habits, he accumulated a moderate property, sufficient to support him comfortably when he was no longer able to work. January 27, 1778, Christian's wife died. She was a woman of more than ordinary strength of mind and ability, exercising great influence in the forming of a substantial and solid character in her children, all of whom became persons of influence in the communities in which they dwelt. She was a sincere and active Christian, the family connecting themselves with the Moravian church immediately after their arrival in America, first at Philadelphia, and subsequently at Lititz, where she is buried. November 16, 1779, Christian married again, his second wife being the widow Barbara Mueller, maiden name Leithold, born August 8, 1740. They had no children. He died April 8, 1800, and is buried at Lititz. His second wife died ___, and is buried at Lititz. I - John Andrew, born April 17, 1750, in Germany; came to America with his parents in 1753; died unmarried January 10, 1775, at Lititz, and is buried there. 8. II - Jacob, born February 13, 1752, in Germany; died January 20, 1778. 9. III - Christian, born October 6, 1753; died March 8, 1820. 10. IV - Catharine, born May 17, 1761; died August 20, 1823. 11. V - Matthias, born April 30, 1764; died April 23, 1809. Besides these, he had four other children, all of whom died in infancy or childhood. John was born in Germany, no doubt on the Kohlhof, but the date of his birth is not known. He is supposed to have been one of the older brothers, and the date of his birth is probably somewhere between 1724 and 1730. In 1749 he emigrated to America, accompanied by his younger brother, Ulrich, landing in Philadelphia September 9, 1749, from the ship St. Andrew, James Abercrombie master, from Rotterdam via Plymouth. Where John first settled is unknown, but he probably remained some time in Eastern Pennsylvania and Maryland, then containing large numbers of settlers from the Palatinate, some of whom he may have known in Europe. Lancaster and York counties, in Pennsylvania, and Frederick county in Maryland, were largely settled by immigrants from that part of Germany. John finally drifted to Western North Carolina, and the first authentic information of him in America is contained in a letter (a copy of which is still in existence [ ...ed note: 1899 _]) addressed to his sister-in-law, Eva, at the Kohlhof, dated from Meadow Creek, Virginia, 1774. In this letter he states that his wife had died three years previously, after having been a helpless invalid for three years from acute rheumatism; but that he and his two children were in good health. In this letter he acknowledges the receipt of 90 gulden sent him through his brother, Christian, and requests the remittance of the balance that may be coming to him from the paternal estate, as he needs it to secure him from the loss of his land. The precise location of this Meadow Creek, where John dates his letter, is not known. In 1776, during the Revolutionary war, his brother, Yost, then residing in Frederick county Maryland, visited him. Yost's descendants say their forefather stated John's residence was on or near the Holston river, in South Carolina, describing the immense flocks of wild geese which congregated on the Holston. This is evidently an error, so far as South Carolina is concerned, as neither the Holston nor any of its affluents is in that state. The place is probably in what was then claimed as Western North Carolina. It is a well known historical fact that during Colonial times there was much dispute in regard to the boundary between Virginia and North Carolina, both colonies claiming jurisdiction over portions of that very territory drained by the Holston river; and when subsequently the boundaries were adjusted some persons found themselves located in one state when they had supposed they were residents of the other: and this may have been the case with John Blickensderfer. Kentucky was organized out of what was claimed Western Virginia, and Tennessee out of Western North Carolina. John's location was probably on an affluent of the Holston in what is now Washington County, Tennessee, but it cannot be satisfactorily identified. On his return to Maryland, Yost is reported as saying John had but one son living in 1776, named John, and there is no further account of either father or son, except that "it is said" the son finally went West. I - John, born date not known. II - A son, born date not know. Very little is known of Jacob. Presumably he was born at the Kohlhof, in the Palatinate, nearly midway between Mannheim and Speyer, where all the rest of the family had their birth. The time of his birth is also unknown, but it is known that Yost was the youngest, and Christian probably the oldest or next to the oldest. The date of Yost's birth being February 2, 1735, and Christian's March 6, 1724, and assuming Ulrich to have been next to Yost, as is generally believed and that Jacob was next to Ulrich, his birth probably was about 1728-1730. He was the first to emigrate to America, landing in Philadelphia September 16, 1748, from the ship Paliene, John Brown master, from Rotterdam, via Cowes. He came with a numerous company from the Palatinate, but unaccompanied by any other member of the Blickensderfer family. There is nothing known of his having permanently settled anywhere, and nothing is known of his descendants, if he had any. Tradition says that soon after his arrival in America he went West and lived among the Indians, nothing being heard from him for many years, when he suddenly appeared among his brothers in Eastern Pennsylvania, dressed in full Indian costume, hunting shirt and breech cloth, so transformed in appearance that none of them would acknowledge him to be their brother. He continued with them some time, vainly trying to convince them of his identity, until one day, in the course of conversation, he all at once asked one of them: "Don't you remember the drubbing we once gave our older brother behind the barn, in Germany, because of his disposition to domineer over us?" This reference to an incident of their early life finally convinced them that he really was their brother. But he did not long remain in Eastern Pennsylvania. He hankered after the freedom of forest life, again went West among the Indians and was never more heard from. How and when his life terminated is unknown. Ulrich was born in the Palatinate, presumably at the Kohlhof, some time between 1724 and 1735. He is generally conceded to have been next youngest to Yost, which would fix the time of his birth about 1731-33. He came to America with his older brother, John, landing at Philadelphia September 9, 1749, from the ship St. Andrew, James Abercrombie master, from Rotterdam, via Plymouth. He signed the declaration of allegiance then required of all immigrants landing in Pennsylvania, and preserved in the Colonial records at Harrisburgh. His autograph is "Ulrich Blickestorfer." These two brothers came to America about one year after Jacob, and four years before the arrival of Christian and Yost. Where Ulrich first settled in America is not certain, but he is known to have been in Lancaster and also in York county, Pennsylvania, and in Frederick county Maryland, where he probably married and first resided. But before the Pontiac war (1763) he had definitely located somewhere in Morrison's Cove, Bedford county, Pennsylvania. From this place he was several times driven by the savages, once with the loss of his oldest son, killed by the Indians. During the Indian disturbances, he remained some time with his relatives in Maryland, but subsequently returned to Bedford county, where as far as it is known he continued to reside for the remainder of his life. The date and place of his death are not known, but he must have attained a ripe age, because his nephew, Matthias [ ...#11 _], in a letter (still extant) dated August, 1806, to his cousin in Germany, speaks of his uncle Ulrich, evidently then living, as a member of the Dunkard Society, and describes him as "quite a small may with an extraordinarily large beard, grown to his eyes, and with but one eye, all of which gives him a very striking appearance." In 1806 Ulrich must have been considerably over 76 years old. It is not known who was his wife, nor where or when she was born, or when she died. I - Jacob, born, date not known. He was killed by the Indians in Bedford county, Pennsylvania. 13. II - John, born, date not known. He married and resided in Montgomery county, Ohio, and died there. III - David, born, date not known. He married Juliana Shirts, in _______. Frederick county, Maryland; was a carpenter by trade. IV - Peter, born, date not known. It is said he lived near Niagara Falls. 14. V - Abraham, born, date not known; resided in 1812 near Salem, Jefferson county, Ohio; is said to have served in the war of 1812 as a substitute, and to have died in Kentucky. 15. VI - Joseph, born about 1780, married, resided and died in Montgomery county, Ohio. VII - Susan, born date not known. She married a man named Peacock, who resided near Moorefield, Harrison county, Ohio. VIII- A daughter, born date not known. IX - A daughter, born date not known. Jost - or Yost, as the English write the name - was the youngest son of the Anabaptist, born at the Kohlhof, in the Palatinate, February 2, 1735. He came to America in company with his brother, Christian, landing in Philadelphia September 29, 1753, from the ship Rowand, Arthur Trau master, from Rotterdam, via Cowes. Both brothers signed the usual declaration of allegiance to the king of England then required of all immigrants to Pennsylvania, the originals of which are preserved in the colonial records at Harrisburgh. Yost's autograph is "Jost Blickensdorffer." Tradition says Yost would not consent to accompany his brother to America until he was promised a rifle. This, considering he was then a lad of 18 years of age, is not improbable. Of Yost's first years in America little is known. He probably spent much of him time with Christian, who first settled near Philadelphia, but subsequently removed to the vicinity of Lititz, Lancaster county, Pennsylvania. At a later date Yost seems to have spent some time in York county, but finally drifted to Frederick county, Maryland, acquiring land and making his home near where Wolfville is located. About the year 1766 or 1767 Yost married Elizabeth Ochs, but it is not known when nor where she was born. In 1776, during the war of the revolution, Yost visited his brother, John, residing on or near the Holston river, somewhere in Western North Carolina, and spent some time with him; but subsequently returned to Maryland. His first wife died about 1780-89, the date unknown, and he remained a widower until some time in 1797, when he married again. His second wife was Margaret Fuller, who was born in 1778 and died February 18, 1830. He continued to reside on his farm in Maryland for the remainder of his life and died July 13, 1826, aged over 91 years. He lies buried in a private graveyard on his old farm near Wolfsville. I - Adam, born date unknown; died young, about 1773. 16. II - Joseph, born June 19, 1768; died September 20, 1841. 17. IV - Elizabeth, born date not known; died June 6, 1829. 18. V - Jacob, born September 21, 1775; died August 6, 1852. 19. VI - Catharine, born ___; died March 19, 1838. 20. VII - Christian born November 16, 1780; died December 1, 1865. Besides these there was another daughter that died young. 21. VIII - Daniel, born June 4, 1880; died August 11, 1843. IX - William, born November 22, 1801; died January 30, 1848. 22. X - John, born December 9, 1803; died January 7, 1884. XI - A daughter, born date not known; died young. XII - Another child; born, date not known; died in infancy. 23. XIII - Margaret, born June 4, 1811; died January 26, 1888. Yost and his descendants departed from the original orthography in writing their name, changing it to the more anglicised form of Blickenstaff, which is uniformly adopted by them. 24. I - Catharine, born November 4, 1775; died October 23, 1866. II - Elisabeth, born, date not known; died, date not known. After her father's death, she accompanied her mother to the "Glades," in Somerset county, Pennsylvania, and her history is lost. 25. I - John, born November 7, 1782; died May 28, 1848. 26. II - Christian, born December 7, 1787; died April 5, 1854. 27. III - Maria, born October 4, 1789; died ____. IV - George, born April 19, 1792, died August 3, 1823. Sarah, born June 13, 1813, and married David Reichman October 18, 1832. I - Thomas, born December 26, 1814, and married Catharine Winsch, the daughter of Jacob Winsch and his wife, Maria Protzmann. II - Catharine, born August 26, 1817. III -Rosana, born March 14, 1820, and died September 26, 1824. IV - Maria, born September 2, 1822 and died August 7, 1823.
her parents to Ohio in 1812 and there married Gabriel Romig. She died July 10, 1823. They had no children. I - John, born August 3, 1783. He married Barbara Heyd, and had one son, John Andrew, born January 31, 1820, and three daughters: Joanna Catharine, born September 10, 1807; Joanna Dorothea, born November 8, 1811; and Salome, born January 3, 1815. III - Lewis, born February 2, 1788. Lewis married Anna Shenk, and had one son, Francis Matthias, born January 27, 1812, and one daughter, Elisabeth Catharine, born December 7, 1813. Whether he had other children is not known. IV - Christian, born November 20, 1790. He married Catharine Koch, born December 30, 1789. They had two sons and four daughters: Maria, born October 5, 1816; William, born June 17, 1818; Sophia, born January 8, 1821; Sarah, born August 11, 1822; Matilda, born October 4, 1823. He married Maria Rudy, and had four sons and one daughter: George Matthias, born January 25, 1819; William Henry, born February 1, 1821; James Rudy, born March 17, 1823; Jacob Benjamin, born December 22, 1824; and Juliana Rosanna, born February 14, 1830. Besides these he had two daughters, twins, that died in infancy. VI - Michael, born January 3, 1797. He married Lydia Harry, who died May 5, 1832, and afterwards Amelia Bachmom, as his second wife. He died about 1840 and his second wife died about 1876, but there is no record of the exact dates. He had three sons and two daughters. Two of the sons died in infancy and one, Charles Lewis, born October 4, 1823, disappeared when a young man and was never heard of again. Of the daughters, Sabina, born May 8, 1821, resided at Lititz and died unmarried in 1896. Ellen Sophia, born December 16, 1835, married John Souder, resides in Lititz and has two sons and one daughter. VII - Anna Salome, born January 2, 1799; died date not known. VIII - Abraham, born August 8, 1804; died date not known. 28. I - Jacob, born December 26, 1790; died September 19, 1856. III - William, born October 4, 1795; died date not known. William followed his brothers to Ohio at an early date, was never married, and resided among them, but engaged in the navigation of flatboats, or "broadhorns", as they were termed on the Ohio and Mississippi rivers, then one of the principal methods of transporting the products of the west to a market. These boats were built on the upper waters of the Ohio and its affluents, laden with flour and other products, and in the spring of the year, when the streams were in flood, floated to New Orleans, where both lading and boat were sold. The navigators then worked their way back during the summer, prepared for another voyage the succeeding spring. On one of these trips, William and his cousin, Joseph Blickensderfer [ ...ed. note: son of # 16 _], found themselves at the Falls of the Ohio (now Louisville), in straitened circumstances, and both there enlisted in the United States regular army for five years. This was in June 1825. William served in the Fifth Infantry, on the Western frontier, at Rock Island and Fort Snelling until 1829, when, having secured a substitute, he was discharged at St. Louis, and starting on his return to Ohio, proceeded as far as Shawneetown, Illinois, from when he wrote to his brother, Jacob, June 24, 1829, but was never afterward heard from. 30. IV - Rosanna, born October 28, 1800; died March 14, 1864. 31. V - Joshua, born July 2, 1802; died December 1, 1874. 32. VI - Matilda, born March 6, 1806; died June 19, 1871. 33. VII - Henry, born August 17, 1808. Was born at the Kohlhof, in Germany, September 10, 1754. He was the only child of his father, who, from the best obtainable information, seems to have died in 1761-62, five or six years before the death of his grandfather, the Anabaptist. The latter at his death appears to have bequeathed the Kohlhof estate to his son's widow, Eva, the mother of John George, in trust for the grandson. John George married Magdelina Neff. He was a member and a preacher of the Mennonite denomination, highly esteemed among his people, and at one time served a congregation of Mennonites at Neuwied; but resided nearly all his life at the Kohlhof, cultivating the estate. With the residents of the Palatinate generally, he suffered much from the devastations of the Napoleonic wars. His son, John, relates that more than once they were driven from the house by the enemies; shot and their house plundered, at one time so completely that nothing was left to subsist upon. He was at times obliged to cultivate his fields by moonlight and sow his seed by night or in heavy fogs to prevent its being taken from him, and in this manner secure a prospect of reaping something for bread for the ensuing year. He resided at the Kohlhof. Neuwied, but died at Konigsfeld. III - Anna Eva, born April 26, 1785; died December 15, 1841. In 1803 she connected herself with the United Brethren's church at Zeist, in Holland, and remained there until 1811, when she removed to Neuwied. In 1819 she married John Peter Runk, of Neusalz, born at Erlanbach, near Speyer,; January 29, 1785, and thenceforward resided at Neusalz for the remainder of her life. Her children were two daughters: Emilie, born January 18, 1822; died, unmarried, January 1, 1844; Constantia Florentine, born November 23, 1823; married Ernst Gottfried Klinghardt, born September 22, 1822. She has two sons, Paul Eugene and Ernst Hugo, and three daughters, Helene Mathilde, Florentine Elisabeth and Hermine Dorothea, besides one son that died in infancy. She resides at Neusalz, Prussia. 36. IV - Peter, born April 11, 1788; died March 17, 1845. Besides these five children, John George had two sons and two daughters who died in childhood. I - Maria Charlotte, born March 17, 1823. She was educated at Montmirail, in Switzerland,d and in 1850 married William Gottfried Muller, residing for some years at Neuwied and then at Konigsfeld, in Baden, and subsequently in Christiansfeld, Silesia. They had two sons and one daughter - Eugene, Rudolph and Lydia. Eugene married in Neusalz, Prussia, and had one son. Rudolph married in Neuwied, but had no children. Lydia married Theo Rau, in Kleinwelke, but had no children. Charlotte died in 1879. Eugene, Rudolph and Lydia are all dead. II - John G., born July 6, 1826. He lived with his father at Neuwied until about fourteen years of age, when he was sent to America, his father deeming prospects in America better for a young man than in Germany. He lived in America as the ward of his relative Jacob Blickensderfer [ ...ed. note: # 28 _], of Tuscarawas county, Ohio, but died September 20, 1843, before attaining the age of manhood. III - Anna Dorothea, born July 13, 1829. She married Krieg. Was born at the Kohlhof, in Germany, April 11, 1788, and resided at the Kohlhof his entire lifetime. In 1809 he married Magdalena Showalter, of Assenheim. He died March 17, 1845, and his wife died December 1, 1864. I - Lisette, born August 20, 1810. She married, April 24, 1831, Jacob Ellenberger, a Mennonite preacher, of Friedelsheim, and had eight sons and five daughters. She died April 1, 1875. II - Catherine, born January 31, 1812. She was never married, and lived with her brother, Philip, at the Kohlhof, where she died August 25, 1875. II - Philip, born January 21, 1815. He married, April 28, 1846, Magdalene Neff, of Assenheim, and resided at the Kohlhof. Their children were: Eliza, born February 28, 1847; married Jacob Ellenberger, a Mennonite preacher, at Friedelsheim. Christian, born October 7, 1848; married Lena Showalter, of Assenheim resides at the Kohlhof and has two sons and two daughters. George, born February 28, 1851, is deaf and dumb, a shoemaker by trade, and resides in Ludwigshafen. Henry, born April 8, 1856; married Anna Blickensderfer, of Harxheim, is a merchant at Ludwigshafen and has four sons. Philip died January 4, 1884, and his wife, Magdalene, March 6, 1895. IV - Babette, born March 7, 1825. She married, February 14, 1854, Gerhard Voght, a baker, in Kindersheim. They have five sons and one daughter. V - Anna, born October 12,2 1826. She married, November 14, 1847, Henry Seitz, a brewer in Schwetzengen, Baden. They have two sons and three daughters. VI - Jacob, born September 20, 1828. Married, July 24, 1854, Christina Stauffer, of Obersulzen, and resided at the Kohlhof. They had six children, of whom two daughters survive, viz: Marie, born May 30, 1857, is married to Jacob Heye, lives at the Hof and has three sons and one daughter; Elisa, born March 13, 1864, is unmarried and lives at the Hof. Jacob died July 17, 1891, and his wife October 20, 1892. VII - John, born October 27, 1831. Was a locksmith by trade and in 1850 emigrated to America and resided in St. Louis, where he followed the business of a gunsmith. He married an American woman and had one son and one daughter. VIII - Henry, born May 6, 1833; died January 8, 1847. IX - Peter, born August 20, 1836. Peter married, August 12, 1865, Magdalena Bergtholpt, of Assenheim, a niece of his brother Philip's wife, and resides at the Kohlhof. They have had six children, of whom four died young and two survive, viz: Abraham, born December 19, 1870, and Marie, born May 26, 1875. Comparatively little is known of John. He was probably born at Morrison's Cove, Bedford County, Pennsylvania, but the date of his birth is not known. Ulrich's sons drifted in different directions, mostly Westward, and the first reliable information of John is that he and his brother, Joseph, settled in Montgomery County, Ohio, on Wolf's creek, about four miles west of Dayton, about the year 1806, or shortly before. Here John married a farmer's daughter, but nothing is known of her except that her name was Hannah, and the records of Montgomery county show a deed was made August 13, 1823, by Jacob Stutsmen and Elizabeth, his wife, and William Brombaugh and Eve, his wife, to Hanna Flickenstaffer for one hundred acres of land in section 20, township 2, range C east, Montgomery county. That this Hannah Flickenstaffer was John's widow is also known. Many of Ulrich's descendants departed from the original orthography in writing their names, some writing Flickenstaff or Flickenstaffer, as above; some write simply Blick, one or two write Flicker, but the greater portion write Blickenstaff, as do the descendants of Yost. John died in Montgomery county about 1816, while yet a comparatively young man, but the exact date of his death is not known, nor is that of his wife. His children were: Emanual, born date not known; a daughter, born date not known. The history of these children is not known, but the records of Montgomery county show the marriage of Catherine Flickenstaff to Daniel Deeter, by Ralph Braddock, justice of the peace, January 19, 1830, and there is strong probability that this was John's daughter. 37. I - John Abraham, born in Morrison's Cove, October, 1794; died September, 1852. II - Jacob, born, date not known; died, date not known. Has a son named David. III - John, born date not known; died, date not known. 38. IV - Joseph, born in Morrison's Cove, about 1804; died June 24, 1874. V - David, born, date not known; died date not known. Resided in Harrison county, Ohio, and died there. VI - Elisabeth, born, date not known; died, unmarried, at Canton, Ohio, date not known. VII - Susan, born date not known. Susan was, in 1812, taken and reared in the family of John Blickensderfer, with her brother, Joseph, and her sister, Nancy. She resided all her lifetime in Tuscarawas county and died at an advanced age in the county infirmary. VIII - Nancy, born date not known; died, date not known. Was reared in the family of John B., and died there while quite young. IX - Marie Catharine, born in Jefferson county, Ohio, March 25, 1809. Marie Catharine was reared in the family of her aunt, Mrs. Abm. Ricksicker. Subsequently, she lived many years in the family of Rev. Samual R. Huebener, at Gnaddenhutten, Ohio, and accompanied them when they went East and to Salem, North Carolina, where she resided for the remainder of her life. She died, unmarried, November 8, 1871, and lies buried in the Moravian graveyard at Salem. Aunt Kitty, as she was familiarly known, was an estimable Christian, beloved by all, and an especial favorite with children. I - Catherine, born January, 1809. She married, January 15, 1828, Christian Shively, a farmer residing about three miles west of Dayton, Ohio. 39 II - Leonard, born May 1, 1811, died August 24, 1869. III - Elisabeth, born date unknown; died _____. IV - Hannah, born _____; died _____. 40 V - Jacob, born December 5, 1816, Resides at Edna Mills, Clinton county, Indiana. VI - Joseph, born April, 1818; died ______. I - Catharine Anna, born August 24, 1822; married William Meyer and had three sons and six daughters. Resides in Tuscarawas, Ohio. II - Dorothea Elisabeth, born April 24, 1824; died September 4, 1826. III - Mariana Louise, born September 27, 1824. She married Samuel Meyer. IV - Jacob Martin, born September 29, 1827, died August 2, 1828. V - Caroline Henrietta, born October 4, 1831. VI - Matilda Margaret, born July 13, 1834. VII - Christiana Sophia, born December 2, 1836. She married Edward Boyd. VIII - James, born January 6, 1839; died _____. 1. Madge H., born April 4, 1860, in Story county, Iowa; married to James McKinney, May 18, 1882, in Adams county, Iowa. 2. Blanche, born February 23, 1862, in Story county Iowa. Married Fred R. Burnham (American scout of South African fame), March 2, 1884, in Adams county, Iowa. 3. Homer C., born January 22, 1865, in Story county, Iowa. Married Linnie A. Nye, who was born in El Dodrado, Kansas. Served in the English forces against the Matabeles in South Africa. Have three children born to them: Fred, Minna and Ruth. Reside at present in Pasadena, California. A member of the electric light and gas supply company. 4. Joseph J., born September 20, 1868, in Clinton, Iowa. Married Daisy E. Russell, who was born June 12, 1870. Two children: Elisabeth E. and Donald H. Is an architect. Office in Los Angeles. Resides in Pasadena. 5. Grace, born in Clinton, Iowa. Married Pearl Ingram in Buluwayo, Rhodesia, South Africa. Served as scout in the first and second Matabele wars, South Africa. Resides at present in London, England. 6. Judd, born March 17, 1873, in Clinton, Iowa. Served in British forces against Matabeles in 1896. Unmarried. 7. John C., born in Clinton, Iowa, September 11, 1875, also served in South African war. Unmarried. 8. Kate F., born in Clinton, Iowa, April 7, 1878. Unmarried. 9. Nina, born in Prescott, Adams county, Iowa, October 14, 1881; died September 24, 1882. 10. Essie, born in Prescott, Iowa, November 24, 1882; died September 28, 1883. II - John, born February 15, 1835. Married, 1861, Eliza Jane Gatlin, born September 6, 1844. Resides at Pasadena, California. III - William, born September 6, 1836. Removed to Colorado. IV - Jacob, born April 15, 1838. Resides at Grace Hill, Iowa. Served in the Civil War. Married Martha Beatty, who was born February 1, 1841 and died March 24, 1888. They have three sons: Eugene Grant, Leslie E. and Robert Lee, and two daughters, Estella and Myrtle, all residing at Grace Hill, besides two sons and one daughter that died in childhood. V - Henry. Served in Civil War. Came home sick, and died in 1863. VI - Elisabeth, born ___. Married Jacob Beatty and resides in Green county Iowa. VII - Eli, born in Tuscarawas county, Ohio. Served in the Civil War. Now residing in the Indian Territory. I - Barbara, born December 9, 1833. She married John Wagoner, March 7, 1852. They had six children, most of whom reside near Cerro Gordo, Illinois (Pratt county). II - John, born November 19, 1835. He married, September 15, 1857, Catharine Kuhns, and had four children, of whom two daughters yet live at Cerro Gordo, Illinois (Pratt county). III - Joseph;, born ___. He married September 3, 1857, Catharine Replogle, and has one son. Both father and son yet reside at Oakley, Macon county, Illinois. IV - Jacob, born ___; died January 23, 1846. V - Leonard, married December 7, 1862, Susanna Frantz, who died about 1878. They had four sons, who reside about Oakley, Illinois. VI - Solomon, born June 4, 1845. On February 11, 1865, he married Mary, the daughter of Andrew and Barbara (Ulrich) Metzger, who was born _____, and died September 29, 1894. He is a preacher of the Dunkard denomination, and resides near Rossville, Clinton county, Indiana. His children: a. Anne, born ___, married William Roote; they have one son and reside ___. b. Noah, born ___, married Ida Neher; they have one son and reside near Rossville, Indiana. c. Andrew, born ___is unmarried and resides near Rossville. I - Joseph, born April 10, 1837. Resides at Rosalia, Butler county, Kansas. II - Susanna, born July 30, 1838. She married a man by the name of Wolf and resides near Los Angeles, California. IV - Jacob, born November 20, 1841. Resides at Rushville, Sheridan county, Nebraska. Besides these six children;, Jacob had two sons and one daughter who died young and unmarried. I - Jacob, born February 28, 1812; died August 28, 1825. 41. II - Elias, born September 16, 1813. Resides near Wolfsville, Maryland. III - Elisabeth, born April 11, 1816. She married Daniel Mangans, and with him removed to Tippecanoe county, Indiana, where they resided and raised a family. He was a member of the German Baptist Church. I - John Clark, born, date not known, before she married Fair, died date not known. He was married and had a family. II - Catharine Fair, born, date not known. She married Abraham Karn and had a family. Died date not known. III - A daughter, born date not known; died young. II - Joseph, born May 12, 1805. III - Catharine, born ___,1807; died November 1810. VII - Samuel, born November 3, 1818. IX - Delaney, born July 29, 1822. I - Elisabeth, who went West with her mother and an uncle and was never married. II - John, who went West several years earlier, and there married Olive Jenkins. They had two children; one died young, the other, a daughter, married a Mr. Hoffman, near Dayton, Ohio. III - Mary, who remained in Maryland for some years. Subsequently she married Samuel Blickenstaff. In 1836 Catharine and one of her children accompanied her brother Christian and his family to Miami county, Ohio, where she resided during the remainder of her life. She died March 6, 1838, the record says, in the 62nd year of her age, and lies buried with her relatives in the family graveyard, near Tippecanoe City, Ohio. I - Matilda, born date not known; died, date not known. Christian's wife, Catherine, died April 3,3 1859, the record says aged "74 years." Christian himself died December 1, 1865. They were members of the German Baptist church, and both lie buried in the family graveyard near Tippecanoe City. Daniel was born June 4, 1800. He married "Margaret" Custard, who was born November 4, 1800. Margaret always went by the name of "Peggy", but her real name was subsequently found to be Rebecca. Daniel and Margaret were married April 8, 1819. Daniel died August 11, 1843, and his wife March 27, 18380. Both lie interred in the family graveyard on Yost's original farm, near Wolfsville, Maryland. I - Susanna, born July 9, 1823; died February 10, 1893. John's wife, Mary, died May 15, 18876, the record says "aged 87 years," and John died January 7, 1884. They were both members of the Disciples church, but are buried in the graveyard of the German Baptist church, near Wolfsville, Maryland. IV - Silas C., born February 11, 1839; died Jan 11, 1871. I - Maria Barbara, born October 17, 1800; died unmarried September 28, 1836. II - Salome, born March 5, 1803. She married the Rev. Samuel R. Huebener October 23, 1823, and died May 25, 1867. They had four sons and four daughters, viz: Matthias Tshudy, born January 1, 1826, died October 8, 1884; Louis Renatus, born January 26, 1831, died March 28, 1874; Obadiah Theophilus, born January 7, 1835, resides in Lancaster, Pennsylvania; Samual Andrew, born March 3, 1837; died June 27, 1856; Joanna Salome, born January 11, 1829; married Abraham R. Beck, resides at Lititz, Pennsylvania. Mary Catherine, born June 17, 1843; married Rev. E. A. Oerter; resides at Bethlehem, PA. Of the other two daughters, one died in childhood and the other unmarried. III - Jacob Blickensderfer, born November 30, 1805. Married, August 24, 1828, Caroline J. Levering, who was born ___, and died March 15, 1830. They had one daughter that died in childhood. January 15, 1832, he married Caroline Harbach, who was born ___, and died April 3, 1873. He resided at Lititz, Pennsylvania, and died November 8, 1866. Their children were two sons and two daughters: Sarah Caroline, born September 29, 1832, married O. T. Huebener and died September 22, 1856. Richard Rush, born February 18, 1835, married Sarah C. Hull; died June 9, 1878. Hayden Harbach, born June 12, 18480; married Emma J. Hull, who was born ___, and died January 27, 1895; he resides at Lititz, Pennsylvania. Mary Ann, born May 16, 1842, married Edward P. Blickensderfer and died September 20, 1889. IV - Mary Anne, born March 6, 1809. Married James G. Leibert of Bethlehem, Pennsylvania; died April 4, 1851. Their children were three sons and one daughter: Richard William, born May 20, 1832; married Maria E. Knauss and resides at Bethlehem, Pennsylvania. Eugene Martin, born March 22, 1835; married Sarah M. Zorn and resides at Nazareth, Pennsylvania. The other son and the daughter died young. V - Pauline Elizabeth, born January 6, 1813. Resided at Lititz, Pennsylvania, and died unmarried March 12, 1895. I - Frederick, born August 23, 1807, in Lancaster county, Pennsylvania. He married Charlotte, daughter of Boaz Walton, a prominent citizen of Tuscarawas county; by whom he had one daughter, Lydia Annie, who married ___ Vogler, residing in Canada, where she had a numerous family. Frederick died March 30, 1839. His widow, Charlotte, married Benjamen Keller and they had a number of children, all in Tuscarawas county, Ohio. II - Simon Peter born June 23, 1813; died January 24, 1880. He married, as his first wife, Susan, daughter of Jacob Uhrich, an early and respected settler of Tuscarawas county. She was born April 11, 1819, and died April 25, 1843. They had one son, Albert, born ___, who married ___ and resides at Gnadenhutten, Ohio. His second wife was Matilda E., daughter of Boaz Walton, who was born December 26, 1816, and died October 21, 1886. Their children were: Cornelia, born ___, married Philip Bosche; resides in Texas; and Martha, married Charles Bartles, resides near New Philadelphia, Ohio. I - Abraham, born September 6, 1810, in Lancaster county, Pennsylvania; died October 18, 1895. Abraham resided most of his lifetime in Ohio, but spent several years in Pennsylvania and several in California. He married Elisabeth Roth and had two sons, Charles and George, and one daughter, Sarah. About 1845 he changed his name to Abraham B. Wood. His son, Charles, died soon after the close of the civil war and left a widow. George, now calling himself George Wood, married Emeline Sausser, is a shoe merchant in the city of Philadelphia. The daughter, Sarah, married ___ Sausser and left children, but died comparatively young. II - Isaac, born October 1, 1813, in Ohio. He married Elvina Meyer, who was born __, and resided on part of his father's farm until a few years before his death, when he removed to Gnadenhutten. Their children were: Josiah, born July 11, 1835; resides near Gracehill, Iowa. Louise, born April 1, 1836; married Tobias Rehmell; died August 6, 1875. Anna, born June 13, 1838, married Lewis Winsch; died 1876. Francis R., born December 17, 1839, served in the civil war and was killed in battle August 11, 1863. Sarah, born May 17, 1844, married Rev. Lewis P. Clewell and resides in South Bethlehem, Pennsylvania. III - Christianne Elisabeth, born July 16, 1817. She married Ferdinand Helwig and resides at Gnadenhutten, Ohio. Helwig is a tin and copper smith by occupation. They have five sons and one daughter, of whom two sons and one daughter are yet living, viz: Edmund Gideon, born February 15, 1841, married Ellen C. Wolle, resides at Gnadenhutten, Ohio. Christian David, born November 19, 1843, married Priscilla Demuth, resides at Kansas City, Kansas. Sarah Elisabeth, born February 20, 1839, married Joseph Walton, resides near Tuscarawas, Tuscarawas county, Ohio. IV - Sarah Louise, born June 6, 1821. She married Lewis Peter, born May 31, 1817. Their children are: Emily married James Haman, resides at ___, Iowa. Simon, resides at ___, California. William, resides at ___, Arkansas. Sarah. Clara, married ___ Belt, resides near Neward, Ohio. Mary, married Joseph Hamilton, resides near Gnadenhutten, Ohio. Addie, married Rev. A. Schultze, resides at Bethlehem, Pennsylvania. Jesse, resides at ___, California. Naomi, married Rev. ___ Bishop, resides in California. I - Levi, born July 6, 1814. Being left an orphan when but seven years old, he was at the age of about sixteen apprenticed to William Bower, of Canal Dover, Ohio, to learn the tanner's trade, where he faithfully labored until twenty-one years old, but he never followed the business in after life. He married Margaret Maurio, and resided for a few years in Tuscarawas county, a farmer by occupation, but subsequently for fifteen years acted as travelling agent and missionary for the American Sunday School Union, residing in Wayne and Stark counties, Ohio. In 1865 he removed to Franklin county, Kansas, and for eight years served as a missionary among the Delaware Indians on the Indian reservation in that county. Subsequently he resided at Ottawa, where his wife died, but for the last year of his life his home was with his son at Hutchinson, Kansas, where he died April 30, 1895. His children were three sons and four daughters, all of whom were married and had families: John M. was a carpenter by trade, served four years in the Army of the Potomac during the civil war, was four times wounded, and died about 1890. Garret V. is an attorney at law; resides at Hutchinson, Kansas. The oldest daughter, Margaret, born in 1840, married Joseph Romig, missionary among the Delaware Indians, died December 13, 1885. Her daughter, Edith, born April 16, 1865, married John H. Killbuck, a Delaware Indian educated at Nazareth, who has been for a number of years superintendent of Moravian missions in Alaska. Ellen was twice married and died about 1891. Catharine married S. T. Kelsey, resides at Linville, North Carolina. Frances married John McClanahan, resides at Colchester, Illinois. Jacob was born December 26, 1790 at Lititz, Pennsylvania. He learned the trade of a cabinetmaker. December 31, 1811, he married Regina Kreiter, daughter of Michael Christian and Anna Regina (Bealer) Kreiter, born December 14, 1792, and in the spring of 1812 they accompanied his uncle Christian and others to Tuscarawas county, Ohio, where he settled on a farm near the village of Tuscarawas. In the spring of 1815, he removed to New Philadelphia, where he resided about four years, and then removed to a farm on Pike run, about four miles east of new Philadelphia. Here he resided until 1827, when he removed to Canal Dover and engaged in merchandising. During his residence on Pike run he three times represented his county in the State Legislature, taking an active interest in advocating the adoption of the system of public improvements which resulted in building the Ohio canals by the state. He continued a resident of Canal Dover until 1841, when he removed to a farm a few miles from Dover, where he resided for the remainder of his life. December 30, 1831, his wife, Regina died, and January 29, 1833, he married Maria Peter, born at Gnadenhutten, Ohio, September 17, 1800. His second wife died August 15, 1840, and July 20, 1841, he married Louise Charlotte Kramsch, who was born March 14, 1795, at Hope, North Carolina. During his residence at Dover he served several terms as associate judge of the court of common pleas, and was a member of the Ohio constitutional convention of 1850. He was a good German scholar, reading and writing that language as fluently as the English, and corresponding with his relatives in Germany until his death. He died September 19, 1856, and was buried at Dover, but his remains were subsequently removed to Sharon, Ohio. His third wife died January 8, 1880. 44. I - Jacob, born May 9, 1816, resides at Oakland, Laclede county Missouri. 45. II - Nathan, born April 13, 1823, resides at Stamford Connecticut. III - Hannah, born February 21, 1826. Hannah married, August 3, 1849, George A. Weiss, of Bethelehm, Pennsylvania and accompanied him as missionary of the Moravian church to St. Thomas, in the West Indies, where they resided until their death, both dying of yellow fever, she on the 16th of July 1854 and her husband four days later. Besides these, Jacob had three sons and three daughters, all of whom died in infancy or childhood. I - Lewis Cass, born December 10, 1854. II - William Allen, born January 25, 1857. He married___, and resides at Dows, Wright county; Iowa. I - Caroline Matilda, born October 13, 1821, at Nazareth, Pennsylvania; died June 5, 1852, near Vandalia, Illinois. II - Eloiza Wilhelmina, born January 11, 1823 at Nazareth, Pennsylvania; died November 24, 1861, near Vandalia, Illinois. She married John McDonough, in Ohio, and had one son, Thomas, born February 28, 1855, and two daughters, Angeline, born April 1, 18580, and Rachel Rosanna, born February 27, 1858; besides seven other children, all of whom died young. III - Maria Elisabeth, born October 31, 1824 at Nazareth, Pennsylvania; died February 22, 1866, near Vandalia, Illinois. She married Isaiah Weidener, who died September 14, 1888, and had ten children, of whom seven attained mature age. IV - Sarah Louise, born October 6, 1822, at Nazareth, Pennsylvania, and died November 20, 1859, near Vandalia, Illinois. She was unmarried. V - John Jacob, born ___, in Ohio; died April 15, 1865, near Vandalia, Illinois. He was unmarried. I - Isaac, born October 8, 1824; died November 1894 in Toledo, Ohio. He served in the cavalry during the civil war. Married Clarinda Swartwood. II - Matilda, born May 14, 1832. Married Frederick C. Gieser and resides at Canal Dover, Ohio. III - Milton, born May 20, 1835. Married Magdalena Doty, resides at Shanesville, Tuscarawas county, Ohio. He served in the One hundred and Sixth Ohio regiment in the civil war. IV - Anna E. born May 20, 1835. Married John Karl. Resides at Canal Dover, Ohio. V - Rebecca L., born May 30, 1838. Married William Thomas. Resides in Tuscarawas county, Ohio. VI - Amelia M., born December 19, 1839. Married Wesley Thomas. Resides in Tuscarawas county, Ohio. I - Augustus Matthias, born at Lititz, August 12, 1835. He married December 26, 1858, Frances Sarah Andrews, born May 4, 1836, in Herefordshire, England, and died May 11, 1859. March 31, 1861, he married Rachel Kritzinger, born March 6, 1837, in Tuscarawas county Ohio. The reside in Canal Dover, Ohio and have one son, George August, and four daughters, besides one daughter that died in childhood. II - Catharine Sophia, born in Dover, Ohio, October 13, 1837. She married William Rosenbury in 1856, who died in 1858. They had one daughter, Matilda Rosenbury, who married J. G. Zimmershied, in Kansas City. Catharine subsequently, in 1863, married Benjamin Fisher in Kansas City. They had one daughter. Besides these, Matilda had one son and three daughters that died in childhood. Henry was born in Lititz, Pennsylvania, August 17, 1808, nearly three months after his father's death. His mother was a woman of more than usual force of character, and to her prudent care and training Henry, his brother, Joshua, and sister, Matilda, were indebted for the formation of the reliable and sound principles which characterized them. He married Elvina Lucinda Beitel, daughter of Henry Christian and Rosanna (Miksch) Beitel, born at Nazareth, Pennsylvania, March 13, 1812. He resided for some years at Lititz, but subsequently removed to Lancaster City, where he resided until his death. I - Ellen, born February 14, 1834. She married Darius H. Starbuck. They one have son and three daughters and reside at Salem, North Carolina. II - James, born August 20, 1835. He married ___. III - William, born April 5, 1837. He married Anna Lotz and resides in Lancaster City, Pennsylvania. They have one son and three daughters. IV - Edward, born February 27, 1839. He married Matilda Grube, and resided in Lancaster, and subsequently in Harrisburgh, Pennsylvania and died November 20, 1887. They had 3 daughters. V - Richard, born February 3, 1841. He married Clara Althea, daughter of Charles and Olivia Loretta (Rauch) Kreyder, and resides at Lancaster, Pennsylvania. They have two sons and four daughters. VI - Mary, born May 9, 1842. She married Emanuel B. Weidler. They have two sons and two daughters. VII - Jacob, born March 8, 1845. He married Cornelia Ackerman. VIII - Harry, born February 26, 1846. He married Elisabeth Hollinger and resided at Lancaster, where he died January 12, 1891. They had one son and one daughter. IX - Emma, born Aug. 8, 1848. She married John Wesley Dorn and resides at Lancaster. They have one son. Besides these nine children, Henry had two sons who died in infancy. I - John Wesley, born August 5, 1840, is married and resides at North Manchester, Indiana. II - George W., born January 5, 1842, is married and resides near Wolfsville, Maryland. III - Amanda Elisabeth, born April 15, 1844. V - Mary Jane, born December 19, 1848; Married Lewis H. Kellbaugh and died August 3, 1885. VI - Rosanna Catharine, born August 29, 1851; died Nov. 13, 1879. VII -Margaret Ellen, Born March 10, 1854, died November 13, 1879. VIII - Phebe Anne, born October 21, 1856; married J. D. Lizer and died September 5, 1884. IX - Lydia A., born December 24, 1858. I - Rosanna, born December 3, 1772, who married first, John Rector, and after his death she married Joseph Blickenstaff, the son of Yost. II - Catharine, born July 31, 1776, who married Hall and resided at Lititz. Rosanna Protzman (the daughter of Jacob) by her first husband, John Recher, had a daughter Joanna, born November 8, 1798 and a son, John, born February 1, 1803; died July 30, 1887. By her second husband, Joseph Blickenstaff, she had two sons: Jacob, born February 28, 1812, who died August 28, 1825; Elias, born September 16, 1813; and a daughter, Elisabeth, born ___. Rosanna may have had other children, but we have no certain knowledge. John was born March 15, 1809, in Miami county, Ohio. He married Hannah, the daughter of Isaac and Elisabeth Karn, born January 2, 1811. He was by occupation a farmer and resided in Miami county until 18__, when he, with his family, removed to North Manchester, Wabash county, Indiana, where he remained until his death. I - Nehemiah R. born October 22, 1852. He married Ida Shuff, resides near Wolfsville, and has five sons and four daughters. II - Cyrus O., born May 5, 1854. Married Mary C. Oden; resides near Wolfsville, they have no children. III - Simeon M., born December 17, 1856. Married Sarah B. Betts, resides near Wolfsville, and has three sons and four daughters. IV - Mary A. A., born March 21, 1860. Married Victor Stottler, resides near Chewsville, Washington county, Maryland; has four sons and one daughter. V - Jacob M., born September 8, 1862. Married Anna Floor; resides near Fountain Dale, Adams county, Pennsylvania, and has one son living, besides one son and one daughter that died young. VI - Sarah P. C., born July 12, 1865. Married C. C. Stottlemeyer, resides near Wolfsville, and has three sons. VII - Elkanah S., born May 7, 1870. Married Melcenah Shuff; resides near Wolfsville and has three sons. John - born Nov. 27, 1804; died Dec. 12, 1888. Mary P. - born February 4, 1824; died February 17, 1881. Married D. W. Blickenstaff January 15, 1852, had family. Jacob was born May 9, 1816 at New Philadelphia, Ohio. At the age of fourteen he was sent to the academy at Nazareth, Pennsylvania, where he spent two years, returning to his parents in 1832. Two years later he was sent to Cleveland and served several years as clerk in a commission house. Returning home, he attended several winter sessions at Franklin college, New Athens, Ohio, and in the spring of 1837 entered the service of the State as civil engineer on the Walhounding canal. The panic of 1841 stopped public works and he returned to Tuscarawas county, (In February, 1839, he married Maria Louise Tshudy, who was born March 30, 1822) where he continued to reside until 1884, when he removed to Omaha, Nebraska, and in 1889 to Oakland, Missouri. In 1845 he again entered the service of the state as member of the Board of Public Works, serving for five years. In 1850 he entered the railroad service, in which, with the exception of four years' service for the State, from 1855 to 1859, he continued almost without interruption for forty years as chief engineer of the Atlantic and Pacific road, in the Government service, and again as chief and consulting engineer on the Union Pacific railway. He was one of the original corporators of the Union Pacific railroad, and located that line west of Green river. He also located and superintended the construction of the Oregon Short Line railway, and a number of lines in Nebraska, Kansas, Colorado and Wyoming, for the Union Pacific Company, remaining in the service of that company until he retired from business, in 1893. On February 11, 1839, he married Maria Louise Tshudy, the daughter of Martin Tshudy, who was born March 30, 1822, and died September 9, 1888. On October 23, 1890, he married Fianna Kreiter, daughter of David Kreiter and widow of Abraham Coldren, who was born November 30, 1830. He resides at Oakland, Laclede county, Missouri. I - Robert, born November 29, 1841. He is a civil engineer; resides at Oakland, Missouri. Married Mary Ross, born September 20, 1841 and died February 22, 1895, and has four sons: Charles H., James E., George R., Robert. All residing at Houston, Missouri; and three daughters: Catharine, married Russell Mumford. Resides at Leb. ; Rose, married James L. Day, resides at Lebanon; Lucy, unmarried. May 20, 1897, he married again, Josephine C. Coldren of Van Wert, Pennsylvania, who was born July 6, 1858. II - Jessie, born October 26, 1843. Married Jane Rondthaler, who was born July 11, 1846, and died September, 1879. They had one son and two daughters: Francis J., Grace M. and Esther W. Grace married the Rev. F. R. Nitzschke, born November 1, 1871. They reside at Elisabeth, New Jersey, and have one daughter, Louise B.
Jesse married again, Anna O. M. Stempel, daughter of Rev. Philip Stempel, who was born July 14, 1859. They have two sons: Jesse S. and Robert Raymond - He is a minister of the Moravian church and resides at Bethlehem, Pennsylvania. III - Emma, born October 23, 1845. She married Herman E. Tietze, who was born ___, and died ___. She has two sons, Joseph and Lewis, and resides at Oakland, Missouri. IV - Edward Peter, born January 16, 1848. 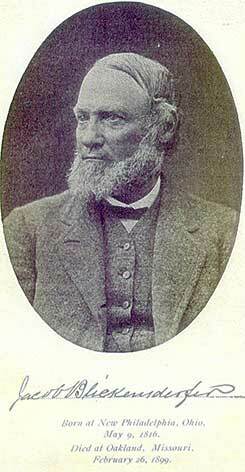 He married Mary Anne, daughter of Jacob B. Tshudy, who was born May 16, 1842, and died September 20, 1889. They have one daughter, Carrie. He married, a second time, Fredericka ___. He is an attorney and resides at Chicago. V - Mary, born February 4, 1852. She married Edwin S. Russell, who was born October 20, 1849, and has three daughters: Alice Gertrude, Emma Louise and Mary M. Resides at Alliance, Ohio. VI - Lewis, born April 15, 1856. Married Bessie Dyar, who was born __. He is a civil engineer by occupation and resides at Omaha, Nebraska. VII - Martin Tshudy, born June 3, 1857. Married Norah Wills, the widow of Amzi Moore, who was born November 19, 1866. They have two daughters and one son: Herman, Ruth and Helen, and reside at Lebanon, Missouri. Martin also legally adopted Myrtle Moore, the daughter of his wife by her former marriage. VIII - Joseph, born August 14, 1862. He married Annie Patrick, who was born ___. They have one son. He is a Physician and surgeon. Residence, New Philadelphia, Ohio. IX - Hermann, born November 25, 1864. Was accidentally shot November 19, 1886, on the Malheur river, in Oregon. Besides the above, Jacob had three sons and one daughter, that died in childhood. Nathan was born April 13, 1823, in Tuscarawas county, Ohio. He was educated at the academy of Beck & Rickert, at Lititz, Pennsylvania, and subsequently studied law in the office of Joseph C. Hance, New Philadelphia, Ohio. Was admitted to the bar at a session of the Supreme Court of Ohio, held in the county of Madison by the Hon. Edward Avery and Rufus P. Spaudling April 23, 1849, and practiced his profession until the fall of the same year, when he removed to Erie county Pennsylvania, and devoted himself to farming and dealing in real estate. He continued to reside in Erie county until 1890, when he removed to Stamford, Connecticut. I - Ulric, born May 1, 1845. He married Susan Downs Hurd, who was born September 12, 1843, and resides in Chicago, Illinois. He has no children. II - James Clark, born March 5, 1847. He married, first, Mary J. McHenry, who was born September 6, 1849, and died July 10, 1875; second, Eva White, born July 3, 1858. He is a physician and surgeon by profession and resides at Denver, Colorado. Has one son, James Clark, born September 18, 1882. III - George Canfield, born October 13, 1850. He married Nellie Irene Smith, born January 29, 1858; is a large manufacturer of typewriters of his own invention, and resides at Stamford, Connecticut. He had one daughter Elsie Canfield, born February 26, 1882; died March 1, 1897. IV - William Jacob, born July 5, 1853. Resides in Chicago, Illinois. V - Mary Hannah, born July 15, 1855. Married Gwynne T. Jordon, born March 17, 1855, and resides in Urbana, Ohio. They have one daughter, Elisabeth McCormick, born September 22, 1882. VI - Charles Edward, born November 20, 1858. He married Rosa Frances Ross, born November 10, 1867, and resides in Erie county, Pennsylvania, a farmer by occupation. He has three sons, Gwynne Canfield, born November 10, 1889; Ross, born April 25, 1891, and William Nathan, born May 4, 1893. VII - Susan Amelia, born April 12, 1864. She married Hammett B. Wilson and resides at Port Angeles, Washington. They have two sons and one daughter: Donnel Canfield, born May 9, 1886; Catharine Nancy, born October 6, 1887 and Hammett Blickensderfer, born July 26, 1896.